Note: Welcome to all of the new subscribers! This is issue #43. Newsletters are sent out every other Thursday; until November, issues will be sent less often due to several teaching engagements. My twin passions for crochet and for fine silver united like two soul mates eight years ago. 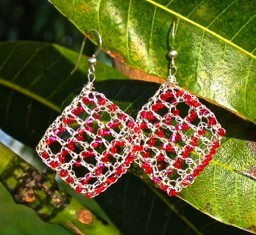 I had high hopes of basing a jewelry business on crochet with precious metals and gems. I knew I wanted to start with pure silver, because it’s known for being an easy metal to work with, its cost didn’t scare me off (especially back then), and I simply love the look and feel of it. Finding “pure” silver wire was my first challenge. I’d once spent a college semester hammering silver ingots at a forge, yet was treated like a li’l missy when I tried to buy silver wire in New York’s diamond district, based on spot prices. It was difficult finding out the yards or meters per 1-ounce reel of 28 gauge silver wire, or if platinum or 14k gold wire is as ductile (bendable, flexible) as "fine" (as in 99.9% pure as opposed to sterling) silver. 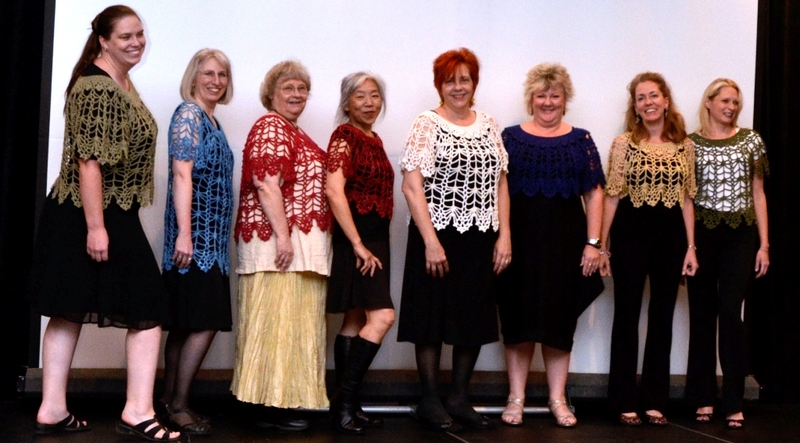 It was a crash course in bringing together the worlds of crochet and metal working. At home, I used plenty of trial and error just to pair a good crochet hook size with each wire gauge (thickness). I didn’t have a chance to build a jewelry business, though. In the short term, I developed muscle problems from crocheting wire. (I had been crocheting lovely silver birthday gifts!) Eight years later, I can now also add that in the long term, some wire crochet hasn't held up. 1. Assemble a tool kit just for wire crochet: special scissors/wire cutter, jewelry findings and fasteners, fabric backings, rubber mallet, crochet hooks. Wire can be hard on hooks, so I prefer using old dull steel ones for strength, to which I add cushioned handles. The old hooks might even get polished a bit by the wire :-) Personally I usually prefer tighter wire crochet, but I'd use a steel hook even if crocheting it loosely. 2. 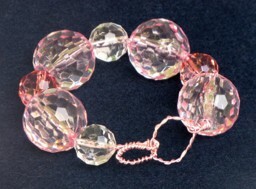 Beads: Nowadays I’d reserve the finicky beads (the bigger beads with the tiniest holes, the irregular holes, or the rough holes that fray fiber) for stringing onto wire. 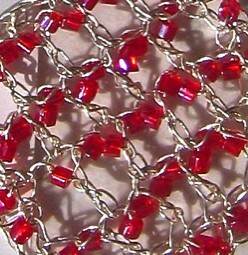 For me, wire makes bead crochet a special pleasure. 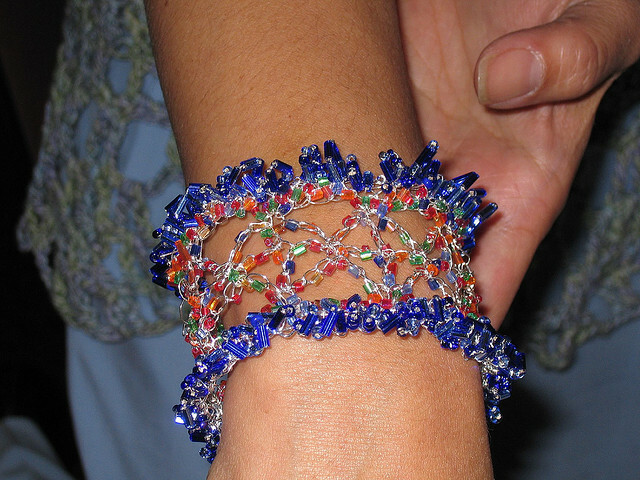 No beading needle required! No fiber bumps to impede sliding! And, wire crochet displays every bead prominently. 3. Pearls: A special case. Their bead holes tend to fray thread, while wire is impervious. I love pearls as much as I love silver, so I've paired them often. Nowadays I’d only pair them if I can find a silver wire that won't tarnish. Fine silver tarnishes as readily as sterling where I live, and pearls are sensitive to tarnish removers. Unfortunately, my pure silver + pearl jewelry pieces seem to age faster than other pieces. 4. 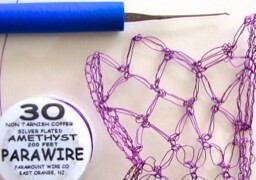 While you're crocheting wire, it may look ugly or messy to you. Don't worry! Just the act of holding onto your work while making the next stitch will crumple it up. Pulling a loop through a loop makes a loop collapse. You just need to “block” it later (nudge some strands into place later with your hook). 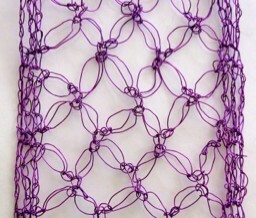 See pictures above: a purple wire bookmark of love knots. (It will end up being hammered and then probably mounted on a stiffened piece of satin unless I wish to wear it as a bracelet.) The prettier love knots on the left were opened with my hook after crocheting more rows. 6. Over time I’ve noticed that recipients of these gifts have no idea how delicate wire actually is, and how would they? I didn’t know until I crocheted it. Traditionally, jewelry is strong enough to show off precious materials through several wearings, then get handed down as an heirloom. Crocheting the metal has already stressed it a bit. 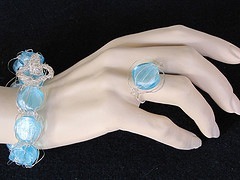 To stay looking new, it would be ideal if some wire crochet jewelry styles were handled like spun glass rather than flexed, tugged, bowed, banged, crushed, or twisted as if it’s Jelly Yarn® (the most durable material I’ve every crocheted!). Nowadays I'd consider reinforcing even substantial wire crochet pieces as described in #5. Most of my crocheted silver dates from just before I had a good camera to photograph all the jewelry gifts I gave away. Doris Chan's Cat's Cradle pattern: We've got photos! Can you believe ALL SIZES on the fashion show runway AT ONCE? When does that EVER happen? Doris crocheted them all! Pattern diagrams are almost ready. Posted: "From Crochet Design Idea to Professional Proposal" Class Resources, which accompany my Professional Development Day presentation in Reno. http://bit.ly/PSHh3O Click on each of the 10 photos for more on the photography challenge they represent. TWO NEW books to watch for! Sneak peek at left of my Rivuline design from the book. 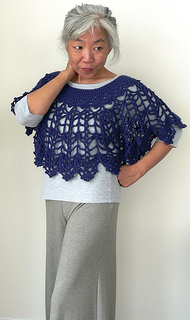 It features some principles of Tunisian Lace making that I teach in my classes. Would you like to see a design by Doris or me in the form of a KIT? If so, please let me know. I think it's a fun idea! Copyright (C) 2012 DesigningVashti Crochet All rights reserved.